Posted July 19, 2017 at 4:39 pm & filed under News. When our ancient ancestors discovered that by settling and cultivating grains they would have a regular and plentiful food source, it was only a matter of time before beer became a part of everyday life. Ever since those early times women have been the driving force behind brewing so we felt a celebration of the women in the industry today was long overdue. 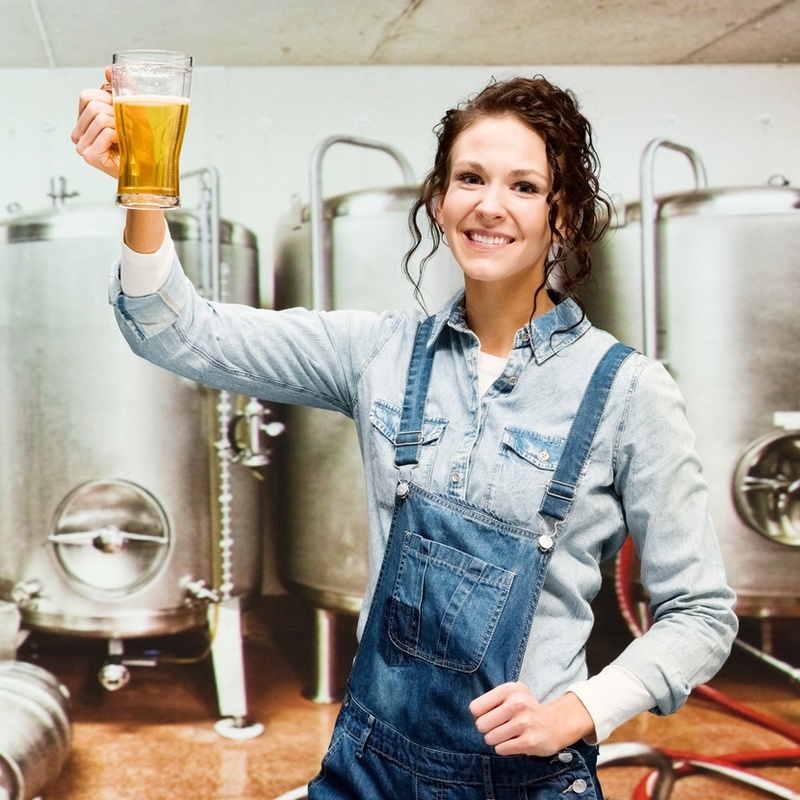 Only within the last few generations has society considered brewing to be a male led profession but with the rise in numbers of new breweries and an enthusiasm for beer since the craft revolution, women are making, enjoying and rightly reasserting their dominance in the industry. A Stanford University research team in 2014 found that 21% of US breweries had at least one woman as founder, CEO or Head Brewer. The research shows that in the world of brewing at least, the values of equality and community empowerment could be a blueprint for the future of commerce. And to demonstrate expertise, the qualified Cicerone programme features a significant number of women, including our favourite local Brewdog Bar Manager, Maria Barney who took us behind the scenes in this blog post. In terms of name-checking, space simply doesn’t allow us to list every brewer that has impressed us with their deft creation of outstanding brews, but several names do stand out including the multi-talented Jaega Wise. Walthamstow, most famous for its dog-racing and 80’s pop has-beens E17, is also home to Wild Card with Head Brewer Jaega at the coal face. With a background in chemical engineering and a sideline as a talented soul singer, she now looks after the production of core beers with names like Jack of Clubs and an English Pilsner style Lager, Joker, and recently appeared on the BBC Radio 4 Food Programme discussing her craft. Chiswick based Fuller, Smith & Turner, the brewer and premium pub company this year announced the appointment of Georgina Young as Head Brewer, the first female in the role since the company’s inception which is, we hope, a sign of more such appointments among the established brands. And of course, if you have marvelled at the devilishly citrus bite of a Beavertown Gamma Ray and been bowled over by its 5.4% punch then you have brewer Lidia De Petris to thank for this gem. The APA has been hailed as one of the classics of the London craft scene. In the education and entertainment side of the brewing world, one of the most interesting and informative podcasts around is “We Made a Beer” run by London-based beer fans Louise Mulroy and Lucy Stevenson. Sharing their passion and their quest to fully understand the complexities of the dizzying range of beers available, their podcast allows the listener to join them on their journey of discovery as they chat with the experts and brew a few themselves. On the other side of the Atlantic, the Pink Boots Society is dedicated to bringing more women into the industry through education and encouraging would-be brewers to take up the craft. Anita Riley, Cellar Operator at Mystery Brewing Company and Pink Boots society representative has just published her book “Brewing Ambition” featuring many home brew recipes, the proceeds of which will help to fund the scholarship programme. In the UK, Sara Barton from Brewster’s Brewery was inspired to create Project Venus which also aims to promote the work of women in brewing. Fighting the marketing men who have sometimes been accused of creating less than encouraging campaigns aimed at a certain strata of male beer drinkers, Australia’s Sparkke Brewery have taken steps to highlight issues of sexism, consent and diversity with striking, slogan led packaging and a commitment to allocating a percentage of their revenue to the causes they support. With a team of female activists at the helm including Head Brewer, Agi Gajic, the Sparkke team have created a range of beverages, from Pilsner to low alcohol ginger beer, that don’t pull any punches. Here at Beer Piper, a team that comprises both men and women that adore their ale, we felt it was time to acknowledge the talented women who make our industry one of the most exciting in the world. Cheers!